The 21-year-old has failed to live up to expectation since he teamed up with the Foxes but showed glimpses of his old self against his former side. Leicester City manager, Claude Puel wants Kelechi Iheanacho to keep improving after his impressive performance in the League Cup against Manchester City on Tuesday. 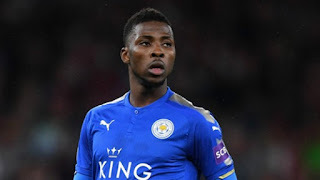 The Nigeria international teamed with the Foxes in the summer for a fee of £25 million but has failed to impress. He has been restricted to just 11 games for the first team, scoring once.